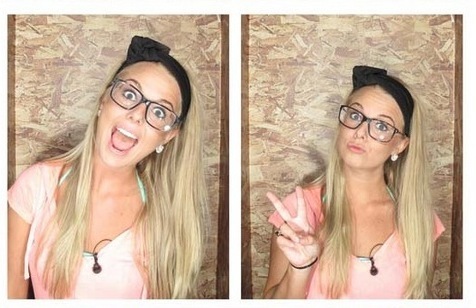 The photo booth has made it’s return for Big Brother 2014 and the HouseGuests on Big Brother 16 were enjoying themselves for a change and snapped some pictures for us to enjoy. It is nice to see the lighter side of things, especially after all the drama that happened yesterday in the Big Brother 16 house! Check out the photos below in our Big Brother 2014 spoilers! For the photos, it is nice to see that Victoria and Jocasta got out of their hideaway beds and came out for some fun in the photo booth! Also, they must have brought it out before Donny went to bed! Of course, we see the “lovebirds” Caleb and Amber taking some photos together, which I am surprised we did not hear Caleb talk about non-stop since it happened! I mean, he is still babbling on about how he got her ice cream one time! The photos are even better since Devin seems to have been MIA during the time and we don’t have to look at his annoying face! Maybe he was spending some time with his crush Brittany, as she is missing from the pictures also. Or maybe he was taking the knife out of Zach’s back, as he is missing as well! HAHA! I am just waiting for him to shave it off. Victoria has a blanket of hair. Where does it end?? Victoria has hair extensions. She has said she doesn’t go anywhere without them. I was thinking to ask if it was fake like Rachel’s was. I’m not sure if it’s because I’ve always hated the EXACT same unimaginative 8 faces all young people make in selfies (puckered lips, tongue out), or if it’s because the booth gives me traumatic flashbacks to the vulgar HGs from last season…. Sorry!!! missed that one, thanks. and she is my fav so far this year. I like her too. Wonder how long her Nicole and Hayden alliance will stay together. Or has it already fallen apart? As of a few hours ago (which is a catch-all disclaimer for being dead wrong in THIS house! ), Hayden was dead-set on voting out Pao, and Christine and Nicole were completely in the opposite camp with Frankie. I fear that Christine is listening too much to Frankie. It could ruin her game. I think most of them are like us. They were against him in the beginning because of a supposed advantage in the voting process. But then he proved to be a competent player and had a great social game. Now he’s blown that up and is making bad decisions. So we’ve ran the gamut of emotions with Frankie. I don’t know if he can redeem himself with fans. Does that make Devin and Brittany “Brittain”? Christine is there. With Jocasta and a couple with Nicole. With Amber also. I was referring to her taking solo photos. Oops, sorry Meowzer. Missed that. Devin most likely has her cornered upstairs and wont let her go. Dude is mental. OK I have had a theory since day one when he went all emotional nut job in the house. Is it possible that Devin takes enhancments (steriods) and he cannot get them in the BB house so he is going through a hormonal imbalance and withdraw in the house. Would explain alot of things? That theory has been discussed by fans web wide. But i’ve read that he admitted to taking adderall. Can’t really speak to that since i didn’t hear it. Besides, they give drug tests before entering the house. Wouldn’t steroids show up in your system? NIce to know that. Here I am thinking I was cutting edge just to find out that i am still behind the eight ball(LOL). But thank you Cat you always seem to know the latest and greatest. Several years ago I worked with a student who tried to get me fired. Within a few months after he got a lily-livered supervisor of mine to call a meeting, everything came out about his antics and I was vindicated. Anyway, one of his co-worker-students came to me and told me that he was instructed as a high school and college athlete how to recognize steriod abuse in fellow athletes and this guy exhibited several of the symptoms – including irrational behavior and extreme paranoia! I was watching the feeds when they were taking the photos. Devin was holding court in the HOH room. I think he came down a bit later but not sure if he posed for any pics. I’m just wondering why Frankie is so convinced that Caleb will win the next HOH? They’ve discussed the next HOH being endurance. But Frankie should know that the biggest and strongest don’t always win an endurance comp. Either way, he’s putting all his eggs in that basket. If endurance I would think Frankie would be a fav. If so what are the chances he blows up the house and puts up Devin and Caleb? It would make him king of the house. I don’t know for sure what Cat thinks about that, but I don’t see Frankie as being that bold. Especially not this early. His “social game” is code for slithering and deceitful. He isn’t going to take anything on head-on. IMO. It actually depends on the endurance comp. It might be tailored to his strong suits and it might not. You can never tell with these comps until you actually see them. And who knows, maybe they’ve come up with something new this season. Honestly, if it comes down to it i expect Frankie to throw it. I don’t think he wants to be in the position to have to choose. Nor do i think he would risk drawing the ire of Devin and Caleb. He’d play it safe. Ding, ding, ding! Totally agree. plus he may not want to risk getting family photos and someone recognizing his famous sister! Good point. But i would think BB would take steps to prevent that. The family member has to sign a waiver if they can be mentioned on the show. Maybe she didn’t sign one in order to protect his identity. Did he already mention her name when he wisdhed her happy birthday on the first after dark show? Honestly i don’t know. I wasn’t watching. But i did read that he wished her happy birthday. He could have done that without saying a name though. Or if he did say her name some of the dim bulbs may not have put 2 and 2 together. Or it’s possible they’ve never heard of her. I just looked it up Jon. He turned to the camera and made a heart with his hands and mouthed the words “happy birthday Ari”. You are right Jon. Frankie did wish her a Happy Birthday when no one else was around. As long as there are still so many people in the house, I think it’s likely the double HoH will happen again and again just like it did last week. That is, Amber said all she wanted was to get the pictures from home. Then she proceeded to do exactly what the other HoH wanted her to do – not caring about the power. I think BB should remove the contact from home perk to ONLY the final HoH. Otherwise, whatever competition they were hoping to generate as a result of the added HoH battles and BotB will fizzle the rest of the summer. Okay, at least for the next few weeks. The simple fact that you don’t usually have TWO people each week hankering to get “blood on their hands” means last week’s scenario is gonna be more common. Most of the house is floating as long as they can. “Most of the house is floating as long as they can” – THIS is the reason for the BOTB. It lessens the amount of people that can actually float through the game. And that’s what the powers that be want. If you don’t battle to be one of the HOHs then you risk TWO people putting you on the block. You’re TWICE as unsafe. It forces people to play the game – socially as well. And if you happen to be one of the HOHs then you battle twice as hard so your noms stay the same or you could become one of them. As for the fact that Amber acquiesced to Devins wants means that her game was basically outed. More alliances can come to light the more there are 2 HOHs. Oh, I probably like the twists more than you do, Cat. But I really hated watching Amber do what she was told and then stating all she cared about was getting pics and a letter from home. When the HoHs are NOT working together, that will definitely be interesting. We just haven’t had it yet. Wow, is this only week two?!?!?!?! I agree Cat but Lilly has a point as the final HOH should be the only one to get pictures and gifts. This will give more incentive to not give up their power. Yeah i see what you mean but it would be unfair to be named an HOH and not get the same perks. They’re supposed to be separate but equal until the last battle is fought. Just a thought. They need to add an extra incentive to the final HOH. Make them really want it. You know like $5,000 or something. Yep. Because if the two hohs work together all the competition is manufactured. Although it may not work out so well for Pao this week!! I think the intent was for them to NOT work together. To compete against each other. I can see why the first 2 HOHs worked together. No one really knew each other. But Devins HOH is another story. We need some head butting going on. I hope that starts to happen before this twist is null and void. I heard that! Don’t hold your breath. It may change 3 more times before the men wake up!! OMG!!! I think Nicole and Cody make an adorable couple. I just looked at photos. I can’t wait to hear Caleb go on about kissing Amber. I bet she ran to wash that off her face. Speaking of photos….i just saw a pic of Donny without his beard. Wish we could post links. It’s worth a look. FYI, Donny and Hayden were hilarious washing dishes on BBAD (at 10:20 pm CDT). To my surprise – at the moment – Frankie seems to have changed his Zach tune, and Pao is going home. Not clear whether Devin and Caleb will be stunned by the turn of events…. But go stretch your legs for a minute. When you return, it will likely have changed. Three more times! Sorry, it was FRANKIE and Hayden doing dishes! Yeah I saw that. They were pretty funny. What happened to Devin’s rule of cleaning up after yourself. Remember he didn’t like Brittany doing everybodies dishes. He felt people would want to keep her because she cleanded their messes up. Hadn’t heard that, but it sounds like Devin! Brittany, Amber and several other women were cleaning earlier in the afternoon, before everyone woke up.